Before ibus there was Bessie , brilliant little documentary pretty amazing what technology has been capable of even back then looks like the early 80's . Yes seen that too. Wonderful to watch, the care those buses received at Aldenham was world class. I remember Metrobuses coming back from overhaul there as well. 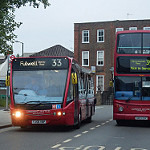 Was interesting to see different batches of buses pop up at Fulwell during the 80's before the allocation settled down. Gives you a warm feeling. And for those who haven't seen it. go to the London Transport museum page and watch 'All that mighty heart' Brings a warm feeling to you. Both now sadly gone. A 'M' bus could be spotted miles away by the way it was turned out.